The Easy Hydro System 3500 Litres - Ideal system for reducing water consumption. The Ecosure 3500 litre Rainwater Harvesting Tank is an automatic rainwater harvesting system which is used for collecting and supplying water on demand for both Domestic and Commercial use. This system consist of an industrial strength MDPE (Medium Density Polyethylene) tank complete with pipe work connections, submersible pump, water filter. This system offers great savings on main water consumption and help towards the environment. Connect your rainwater downpipe to the Ecosure underground water filter via underground pipework. Using the other 4" outlet on the underground water filter, connect this to your Ecosure underground water tank using one of the pre-moulded 4" outlets in the tank (this will need to be drilled out). Drill a hole near the top of water tank and feed the rainwater pipe into the tank. Before lowering your water pump into the water tank you should connect the rainwater pipe to the water pump. Run the rainwater pipe to where want to put your garden tap. 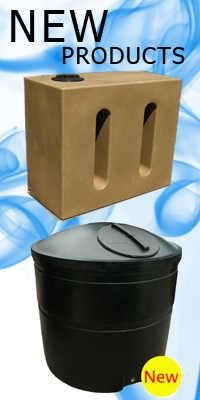 Why Ecosure Rainwater Harvesting Tanks? The HydroForce Series 3 is an electronically-controlled, pressure-sensitive, submersible, centrifugal roto-dynamic pump with no reciprocating parts. - Pressure-sensitive (demand) pump which turns itself off until there is a demand for water. - Max head (nominal) 35 metres, pump pressure at outlet 3.5 bar. - Dry-run Protection: when no water is detected for 8 seconds, the pump is turned off by the printed circuit board (PCB) in order to protect the motor and pump from burning out. Automatic reset after a period of 30 minutes. If water is still not detected, subsequent reset periods are 1.5 hours, 3 hours, 7 hours, 12 hours, 24 hours then back to the beginning of the cycle. Additionally, a thermal switch, not connected to the PCB, turns the pump off when motor overheats. It resets when cool which make take several hours. - New: Inlet cartridge filter, inlet strainer and output pipe connector are factory-fitted and the seals tested to ensure proper running of the pump. - Electricity consumption 800 watts at 220-240 Volts AC 50 Hz (requires 10 or 13 amp fuse and RCD mains socket). Connection cable 10m H07RN-F.
- Inlet port to the non-removable filter 1 inch (25mm) female BSP. Output port 1 inch (25mm) female BSP provided with push-fit connector for 1 inch (25mm) MDPE pipe (1 ¼ inch (32mm) connector option by special order). 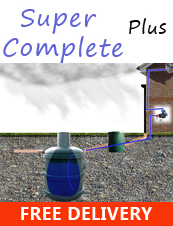 Why should I have a Rainwater Harvesting System? There are many reasons why you should invest in a rainwater harvesting system. Firstly it's a big money saver when you have your system in place and you can run the system to suit your own needs and requirments. Some people only prefer a rainwater system for the garden so that they can use the water and feed their garden without using the costs they use from their mains water supply. Many people have a rain water system that is pumped through the home and garden and they save even more money when using it on household appliances that use a great deal of water. Q: Can I drink the rainwater I collect? A: Without filtering the rainwater with a UV steriliser it cannot be consumed. Q: What can I use my collected rainwater for? A: Rainwater can be used most things in the garden as it is better for plant than tap water. Rainwater can also be used in the house to flush the toilet and also run your washing machine. Rainwater can also be consumed if filtered properly.